It is with great pleasure that we offer Performing the Library! 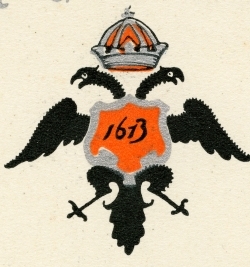 for 2018 – 2019. 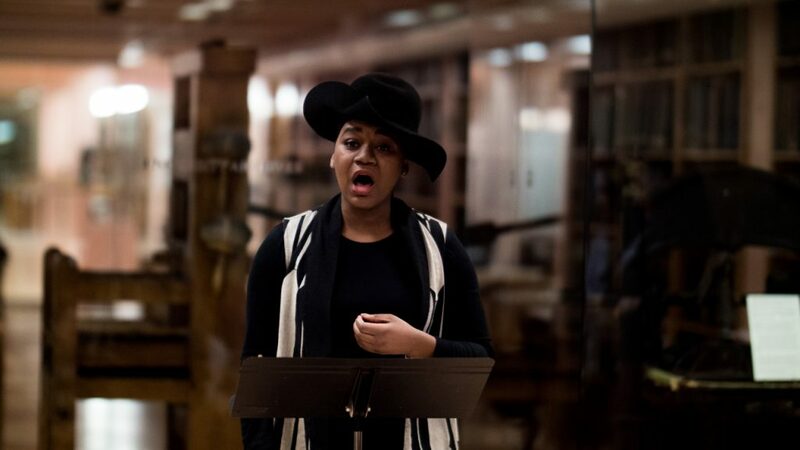 Now in its third year, this program engages collaboration between the Libraries and Columbia students with a focus on exhibitions and events that celebrate the library as a collection, a space, and a resource. Performing the Library! is an opportunity to bring to life the books and objects that make up our collections and to reflect on the stories, ideas, lives, and creative works that are carefully preserved by the Libraries. Central to this year’s event is the Mural Project, a “takeover” of the bulletin board spaces in Butler Library. The bulletin boards in Butler offer large and small spaces for exhibitions of student work that reflects on the theme of the library. 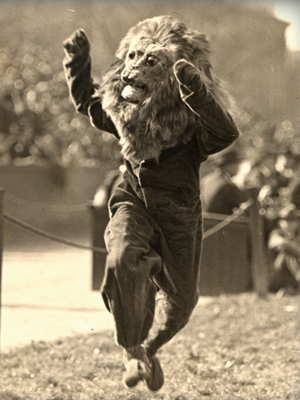 For more information about the series and past participants, read this article or visit student-produced exhibits, on display in 300 Butler Library through December 2018. A student participant in the 2016 – 2017 “Performing the Library!” event reads an original written work. We are now accepting ideas for 2018 – 2019 exhibits and encourage any student who may be interested to become a part of Performing the Library: a Series of Happenings! Students can submit individual project ideas on a small-scale or collaborate with peers for a larger group project. We would like to represent as many student projects as possible. The exhibits offer the opportunity to create murals, graffiti works, cutouts, compose original texts, or exhibit photographic works. Two bulletin board panels each measuring 4’ 10” x 3’. A proposal for these large bulletin boards should focus on a mural exhibit. The proposal can call for one or both boards. This is a central location with long-range views. Four panels each measuring 2’ 7.5” x 4’ 8”. A proposal for these large bulletin boards should focus on an art exhibit. The proposal can call for one or all four boards. Four bulletin boards each measuring 2’ 9.75” x 2’ 9.75”. The proposal can provide a theme for all four boards or a single board. Comparative Literature & Society (615 Butler Library): Two bulletin boards each measuring 1’4” x 3’10”. Early Modern/Modern Europe and Moral & Political Theory (504 Butler Library): Two boards, one measuring 1’ 4” x 3’ 11” and one measuring 1’ 2.5” x 3’ 11”. Islamic Studies (602 Butler Library): Two boards, one measuring 1’ 2” x 3’ 7.5” and 1’ 1.5” x 3’ 7.5”. Latin American Studies (503 Butler Library): Two boards, one measuring 1’ 2.5” x 3’ 11” and 1’ 4” x 3’ 11”. South Asian Studies (601 Butler Library): One board measuring 2’ 5.25” x 3’ 7.5”. The exhibits for the reading rooms listed above should focus on the associated theme or geographic location. Proposals should be submitted by November 5, 2018. Proposals will be reviewed by November 19, 2018. Installations will run from December 2018 – January 2019. To submit your proposal, please send to Nancy Friedland, Librarian for Film Studies and Performing Arts, via email (nef4@columbia.edu) and using the subject line Performing the Library – Proposal. This entry was posted in Events and Exhibits, News and tagged murals, Performing the Library! on October 9, 2018 by al3655. Columbia Libraries is very pleased to announce the launch of the website for the digitized data of the Language and Culture Atlas of Ashkenazic Jewry. An accompanying guide to the use of the digitized materials with many supplementary materials is also available. 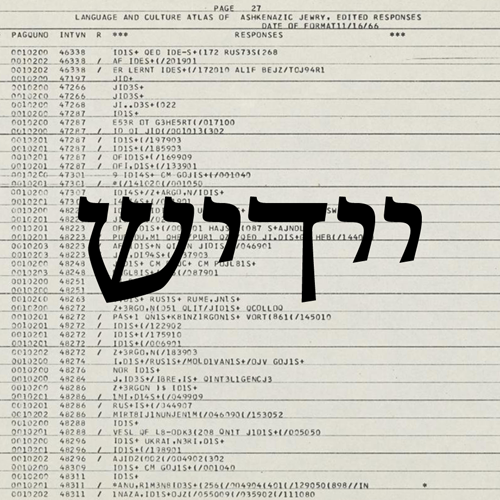 The LCAAJ archive consists of over 600 interviews conducted between 1959 and 1972 with native speakers of Yiddish, documenting the effects of physical, linguistic, and cultural channels and barriers on the geographic fragmentation of the Jewish and diverse non-Jewish populations that coexisted in Central and Eastern Europe before World War II. As part of the launch of the project, an exhibition called “Yiddish at Columbia” will be mounted in the Chang Octagon Gallery in the Rare Book & Manuscript Library in early March. Additional events will be announced at a later date. This entry was posted in Events and Exhibits, New E-Resources, News and tagged Digital Library Collections, Jewish studies, Language and Culture Atlas of Ashkenazic Jewry, LCAAJ, National Endowment for the Humanities, NEH, Rare Book & Manuscript Library, RBML, Yiddish on January 22, 2018 by al3655. Beat the craze of finals with the Libraries! This entry was posted in Events and Exhibits, News and tagged finals, stress relief on December 4, 2017 by al3655. The Columbia Center for New Media Teaching and Learning hosted its 6th biennial New Media in Education Conference on February 1, 2013 at the Columbia University Faculty House. Since CCNMTL's first conference in 2001, these free events have brought together the Columbia community to explore how digital tools and emerging technologies can enhance teaching and learning. On Wednesday, February 27, the Center for Digital Research and Scholarship (CDRS) teamed up with Columbia University Libraries/Information Services, Columbia’s Institute for Data Sciences and Engineering, and Elsevier to host the Research Data Symposium, which lead discussion on topics related to managing and curating research data and a variety of other research outputs. The event featured four speaker panels – filmed by our video team and now available on Youtube here – addressing the different stages of the research data life cycle, with representatives from Columbia faculty, learned societies, research institutions, funders, and publishers examining the implementation stages, available technologies and associated challenges and engaging in lively debates on the barriers for managing, preserving and accessing research data. The event was by all accounts a great success, with 250 in-person attendees, 200 people joining the livestream online, and hundreds more joining the debate on Twitter using the hashtag #RDS2013. 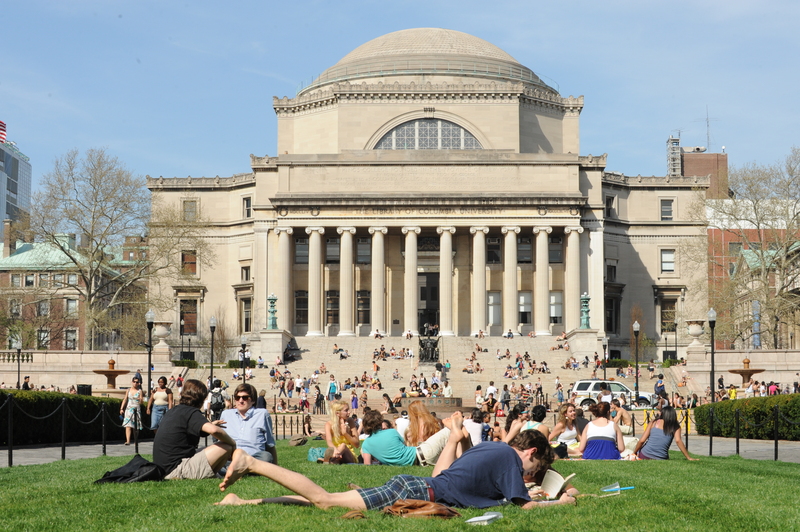 On Friday, March 22, Columbia University Libraries hosted the 10th Columbia Library Symposium: "TRENDING: new opportunities in the evolving academy," which explored the changes in higher education and libraries. The symposium focused on the idea that while libraries are being re-imagined to keep pace with evolving scholarly needs, they're also evolving to provide leadership in addressing broader institutional challenges presented by the transforming academic enterprise. This entry was posted in Events and Exhibits on April 16, 2013 by Allison. The exhibition Quatercentenary of the House of Romanov features objects drawn from various collections held by the Bakhmeteff Archive and the Rare Book and Manuscript Library at Columbia University. It consists of books, correspondence, original charters, maps, photographs, posters, personal documents, ephemera, and books and other possessions that belonged to the Russian Imperial Family. The exhibition will be on display from February 14th – June 28th, 2013 in the RBML’s Kempner Gallery. One highlight of the exhibition is the 1622 manuscript Charter of Tsar Mikhail Fedorovich Romanov granting land and other privileges and rights to Onufrii, Archbishop of Astrakhan and Terek. Never shown before and unpublished, this charter is a very rare and significant document from the reign of the first Romanov tsar. Another highlight is the recently opened collection of nearly 500 letters sent by Dowager Empress Maria Fedorovna, mother of the last Russian Emperor, and her two daughters, Grand Duchess Ksenia and Ol’ga, to their close friend and companion, Princess Aleksandra Obolensky. There letters are written in French and Russian and reflect the daily life and expectations of the Imperial family in exile. Most poignant is a white lace parasol that belonged to Aleksandra Fiodorovna (1872-1918), the last Russian Tsarina, along with a never-shown-before while lace pillow, that was also her property, preserved by one of her ladies-in-waiting, Countess Mariia Semenovna Benckendorff. Other items from the reign of the last Romanovs include a variety of elaborate menus and other ephemera relating to the coronation festivities of Nicholas and Aleksandra in 1896, a print announcing of the birth of the Tsarevich, Grand Duke Aleksei Nikolaevich, in 1904, a draft of Nicholas II’s abdication manifesto, 1917, and a volume of Nikolai Sokolov’s Preliminary Investigation into the Death of Nicholas II and His Family, Ekaeterinburg, 1918. This entry was posted in Events and Exhibits, Uncategorized on March 12, 2013 by Allison. The digital age has greatly enhanced opportunities and possibilities for a single oral history interview or project to be globally distributed and, potentially, have a major impact on the historical record. Doug Boyd will discuss new models for engaging and empowering users of oral history in a digital environment. He will also discuss the web-based, system OHMS (Oral History Metadata Synchronizer) that inexpensively and efficiently enhances access to oral history online, created at the Nunn Center. Doug Boyd Ph.D. serves as the Director of the Louie B. Nunn Center for Oral History at the University of Kentucky Libraries. He is currently directing the IMLS National Leadership Grant OHMS: Enhancing Access and Discovery of Oral History Online and recently managed the Oral History in the Digital Age project, a national initiative exploring current best practices for collecting, curating and disseminating oral histories resulting in an online, open access publication containing over 72 essays. For more information, please email Terrell Frazier at terrellfrazier@columbia.edu. This entry was posted in Events and Exhibits, News on February 6, 2013 by Allison. 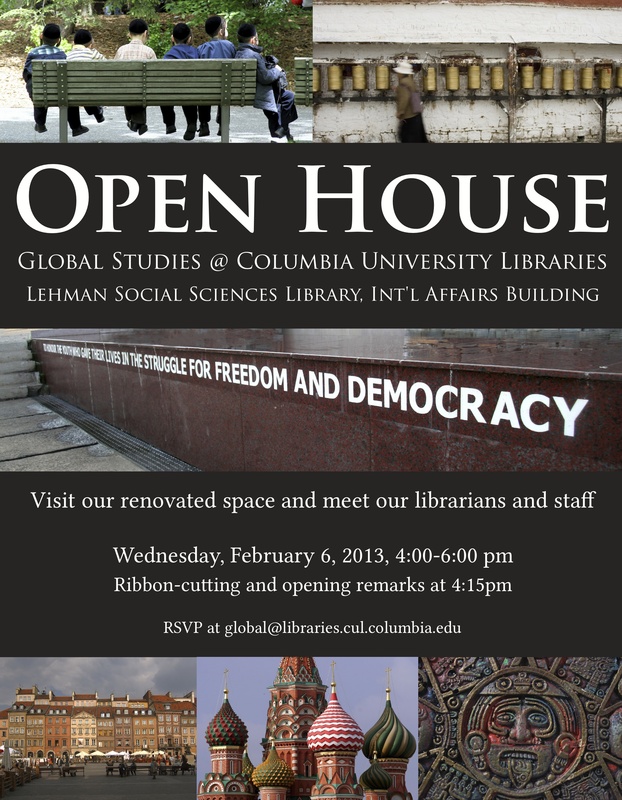 Join us next WEDNESDAY, February 6th for the Global Studies Open House. 309 Lehman Library, 4-6pm. Check out the new space, meet librarians and staff, learn about services, and enjoy refreshments. See you there! This entry was posted in Events and Exhibits, Uncategorized on January 31, 2013 by Allison. 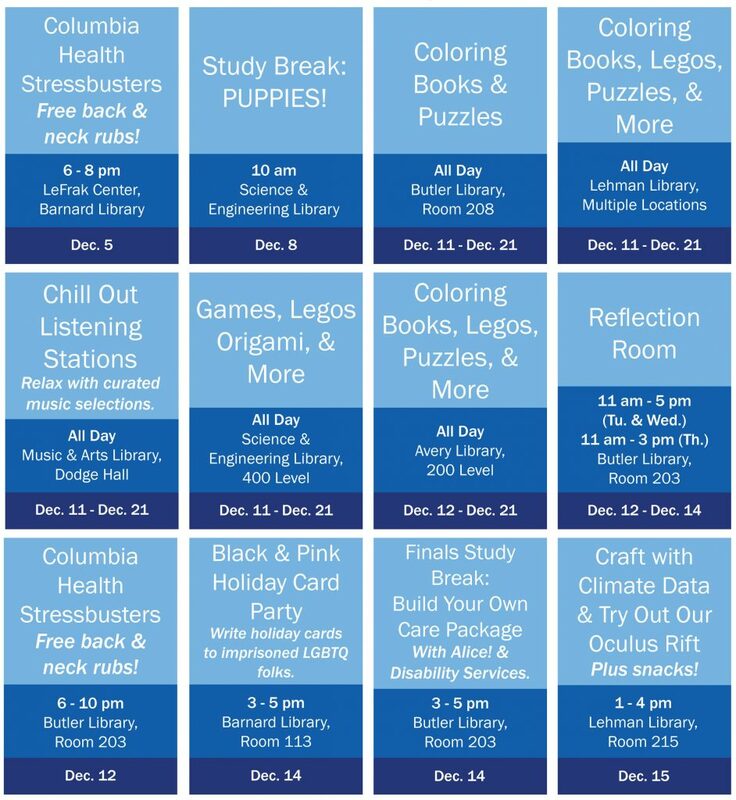 Stressbusters will be in Butler 203 on Wednesday, December 12, giving backrubs, and offering tips for reducing stress and more. Librarians will also be on hand to answer questions and hand out healthy study snacks. Check out Facebook for more info. Research Librarians and Subject Specialists – find them at the Butler Reference Desk or contact a staff member directly. Librarians are available to answer questions through email, text, and chat. Keep up-to-minute with Library news by following us on Facebook and Twitter. Anything else we can do? Let us know! Happy studying! Go get 'em! Roar! This entry was posted in Ask a Librarian, CLIO Tips, Events and Exhibits on December 3, 2012 by Emily.